People say the eyes are the ‘windows to the soul’, and that when they light up it is like a glistening array of constellations. The deepest excitement, aspirations, and personality of the owner are revealed. The eyes’ movements – a glance when talking, thinking, eating – tells us so much about the person: whether they are direct and confident, or self-aware and shy. In London, I don’t see many pairs of eyes. I am too afraid to catch them. Londoners move independently, with speed, not wanting to connect. (The only connection they want is the one from Bank to Waterloo). Instead, I look down a lot. My eyes trail the pavements, follow the escalator from dingy underground to fresh(er) air. Because I spend so much time looking down, I realised where the real window lies – our socks. Now, bear with me here. I know I went from attempting to be poetic to something really strange, but just hear me out. On this particular day I happened to be sporting some green Slytherin socks, which immediately tell people I’m a Harry Potter fan, well-read, and I don’t go for the norm of Gryffindor. I looked around at the people occupying the same tube carriage as me, and realised they were all wearing a very similar uniform: long coats, shirts, trousers, suits and briefcases. The usual business attire. It was just by looking at their feet that I managed to distinguish them and transform them into real people rather than clones. There was the man squashed at the end, his briefcase balancing precariously upon the carriage floor, drawing attention to his bright yellow socks. Despite his tight grimace (he was probably thinking about the stock exchange), I could guess that he was a family man. His socks reminded him that it is his daughter’s first day of school- they were the same colour as her new, pristine uniform. The gent next to him, wearing an identical suit, had blue socks with burgers patterned all over – was he thinking about lunch already? Then there was the lady sitting opposite me, dressed in a pretty modern pantsuit. She looked distressed as she hurriedly turned the pages of her notebook, dropping her pen onto the floor next to her feet. Her socks were cream and lacy. I imagined her being the sort of woman who loves vintage fairs and Victoria Sponge, who smells of tea leaves and owns a cat named Marjorie. This may not be the most groundbreaking “What to Do in London” post, but it’s a fun little game I like to play to pass the time on long commutes. 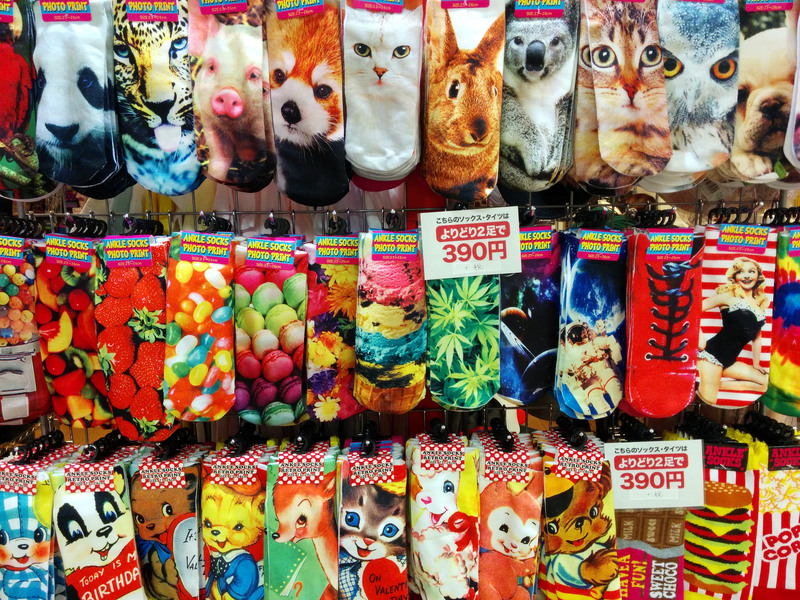 Socks are the secret archways to our personalities and reveal things about us all – the choice of pattern, style, and colour leaks information about us to those around us. So when I next reach for my plain grey pair, I’ll remember how I could be identified and opt for leopard print instead! This is brilliant – love this!